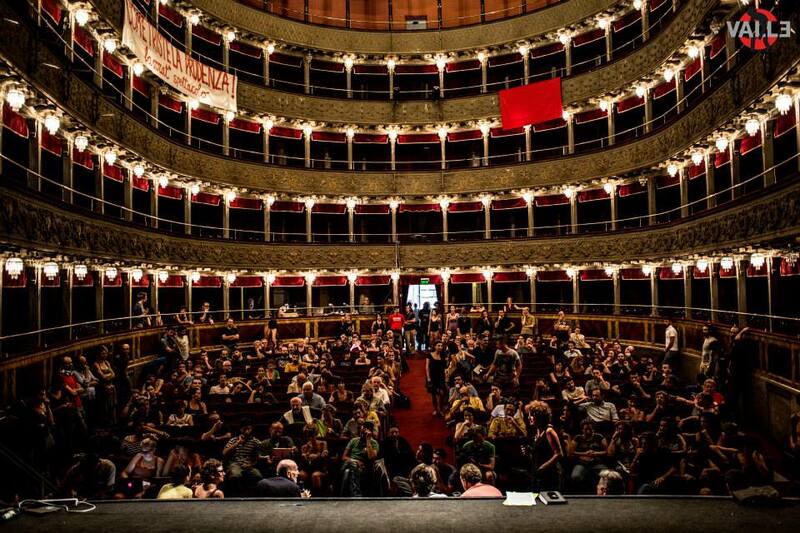 Since June 14th, 2011, a community of artists and citizens has transformed Teatro Valle, the oldest and most prestigious theatre in Rome, then at high risk of privatization, into the “Teatro Valle Occupato”, one of the most advanced experiments merging political struggle and performing arts in the current world. A trust-like legal entity, the “Fondazione Teatro Valle Bene Comune” was created in the interest of future generations, with a membership of almost 6.000 people by a genuinely new process of cooperation between some well-known jurists and the Assembly of artists and citizens. While a notary has recognized the Foundation, the Prefect of Rome has denied its moral personality on the assumption that possession was not a sufficient title on the Valle premises. Nevertheless, in three years the occupation, though formally never authorized, has succeeded in becoming a new institution of the commons, studied by scholars worldwide and the object of many publications. Because no authority in Rome has ever asked the occupants to leave and the municipality has paid the energy bill (roughly 90.000 Euros per year), it would be difficult to deny that the occupation was largely tolerated (even by the previous post-fascist mayor). Certainly the occupants have taken very good care of the ancient Theater, including paying for small renovations, and have generated three years of exceptionally interesting shows, performances, meeting, educational programs that the population could attend on the basis of a donation system according to the possibilities of each one. The Valle experience has also inspired similar actions to protect theaters and public spaces throughout Italy; it is promoting a nation-wide experiment of codification of commons institutions involving some twenty of the leading academic lawyers in Italy; it has produced its own shows performed Europe-wide and has attracted to the Valle some of the best-known artists and intellectuals in Europe. The European Cultural Foundation, among others has granted the prestigious Princess Margriet Award 2014 to the Teatro Valle and the ZKM of Karlsruhe has devoted to that experience a stand in a recent major International exhibition on social movements worldwide. After the European Elections last May, possibly as a consequence of an ill-conceived legalistic stance by the new Government, early negotiations to settle the dispute concerning the title to the Theater have been suddenly terminated as the Assessor of Rome responsible for culture in Rome has been removed and not replaced. As a reply to the Foundation request to resume negotiations, the new major of Rome, a member of the ruling Democratic Party and a well-known academic doctor, has released two days ago a statement asking the occupants to leave, threatening police intervention and proposing a public auction to privatize the management of the space. A meeting between the Foundation, the new Head of Culture Giovanna Marinelli, president of the Cultural Commission of the City and representatives of the Teatro di Roma followed. Requests for a public and transparent dialogue path, which is a guarantee for the 5600 members, with the aim of managing the delicate phase of transition towards a model of participated theater, was offset by the conditio sine qua nonfor the immediate release of the theatre. This cannot happen! The city of Rome, as a cultural center of the world deserves a better solution to the Valle issue. We strongly plea the Italian political authorities to look for a method which facilitates rather than repressing institutional and cultural experiments to run the commons. We have very little time to save this experience, dozens of intellectuals from all over the world, from David Harvey to Stefano Rodotà, from Slavoj Zizek to Étienne Balibar, from Michael Hardt to Salvatore Settis to Ugo Mattei to representatives of prestigious European Museums, performing and contemporary arts centres, Foundations and cultural institutions are mobilizing to defend this experience with this international call.But now only a mobilization of citizens and institutions can save this cultural and political symbol! The solutions to transform this innovative Foundation into a fully legal, recognized and working reality are there. It would suffice that the institutions sit together with citizens, artists, workers entertainment workers to experience a new participated way of managing public goods, providing spaces of freedom and self-determination. To do this we will deliver directly to the Mayor of Rome Marino and the head of the culture department Marinelli thousands of signatures of Italian and European citizens, artists and intellectuals. ALL TOGETHER WE CAN CONVINCE THEM, SIGN NOW AND SHARE WITH EVERYONE! Enter your email address to subscribe to Artleaks and receive notifications of new posts by email.